The end of a chapter: It Takes Two! Since 2014 we’ve been running a flagship project sponsored by the National Arts Council and called “Mentoring Our Future Writers”. Saturday, 18 February, saw us close the book on the final chapter of this inspiring and heart-warming endeavour in which we paired young aspirant writers with professional mentor writers. Each pair produced two short stories – connected in some way – that were published first on the FunDza mobi network and then in print format, in the series of anthologies entitled It Takes Two! First we ran the project in the Western Cape, then in Gauteng and finally in KwaZulu-Natal. The very last part of the project was to launch volume 3 of It Takes Two!. FunDza did this in conjunction with publisher Cover2Cover Books, Adams Bookshop and Ike’s Bookshop. The venue was the popular Ike’s Bookshop upstairs veranda overlooking Florida Road in Durban. We decided to do the launch on a Saturday afternoon so that it would be possible for the mentees to make it easily. 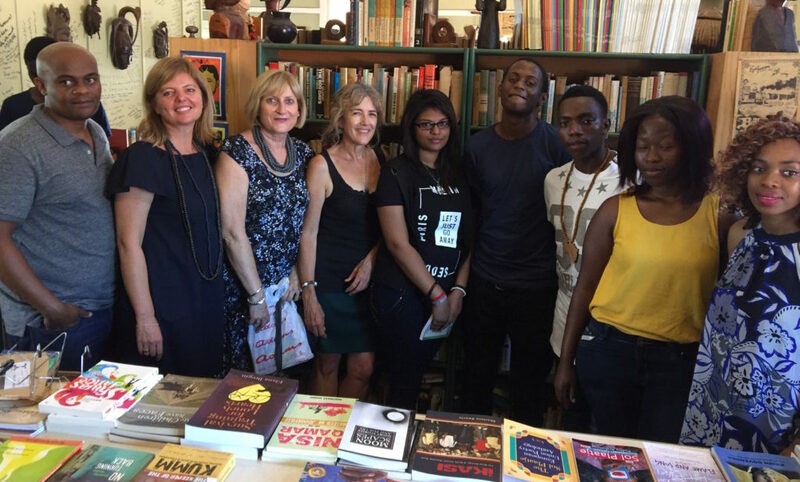 Despite this slightly unusual book launch day and time, not to mention the incredible heat wave – 34 degrees plus humidity in the shade – there was a good turnout of booklovers, writers and supporters, including some young aspirant writers and poets who were keen to connect with FunDza. Sadly, Ros Haden, who has guided the creative process of the project since inception, had to cancel her involvement at the last moment for family reasons. So, I had to make the trip alone. But, I asked Dianne Stewart – who was both a mentor writer and the project manager of the KwaZulu-Natal leg – to step into the breach and run the proceedings. After welcoming everyone and introducing the project, I handed over to Dianne, who called each of the writers up to read a short section of their story and answer a question or two about their story or their experiences during the process. How wonderful to hear how the mentee writers had benefitted from the experience – and to know that the mentor writers had gained a great deal too. Many of the mentor writers noted how they had been challenged to write in different ways – and experiment with different genres – to fit their story in with the mentee’s one. A big thank you goes to Cedric Sissing of Adams Books for organising the launch and to Joanne Rushby of Ike’s Books for hosting the event, to Dianne Stewart for her stalwart support and generous facilitation, and to all those who attended. Deep thanks goes to the National Arts Council for their support of the project. And, congratulations goes to all the mentors and mentees who worked so hard on their stories – we are so proud of the work that came out of this. Nompumelelo Makhaye and Carol Campbell’s stories Nkanyezi and House of War follow the life of a young man, shunned by his family , who makes his way from a rural area to the coastal town where his fate awaits. Njabulo Shongwe and Dianne Stewart wrote romantic comedies about love and betrayal in Love Never Dies and its sequel, Victory. Leanne Raman and Rosamund Kendal bring the fantastical ‘Captain Kind’ and ‘Prof V’ to life in the fantasy super-hero stories: The Adventures of Captain Kind and Going Viral. Israel Lumile and Sifiso Mzobe wrote two very different stories, one historical: The Greatest Battles Are Within – about power struggles in the Zulu kingdom, and the other a contemporary crime story, Philasande and The Missing Girls. Both take place on the same land, once a Zulu village, and now Umlazi township in Durban. Elana Bregin and Nokuphila Nzimande wrote entertaining stories of lies and deception in the art of romance in The Babe Magnet and Chasing the Good Life. Find the book It Takes Two! Vol 3 through Cover2Cover Books.